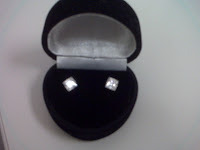 When I was contacted by diamondearrings.org to see if I would like to receive a free pair of simulated diamond earrings as part of a promotion for their site, I said SURE! Because hello? Whether real or (obviously) fake, I'm not going to turn down free sparkly jewelry.